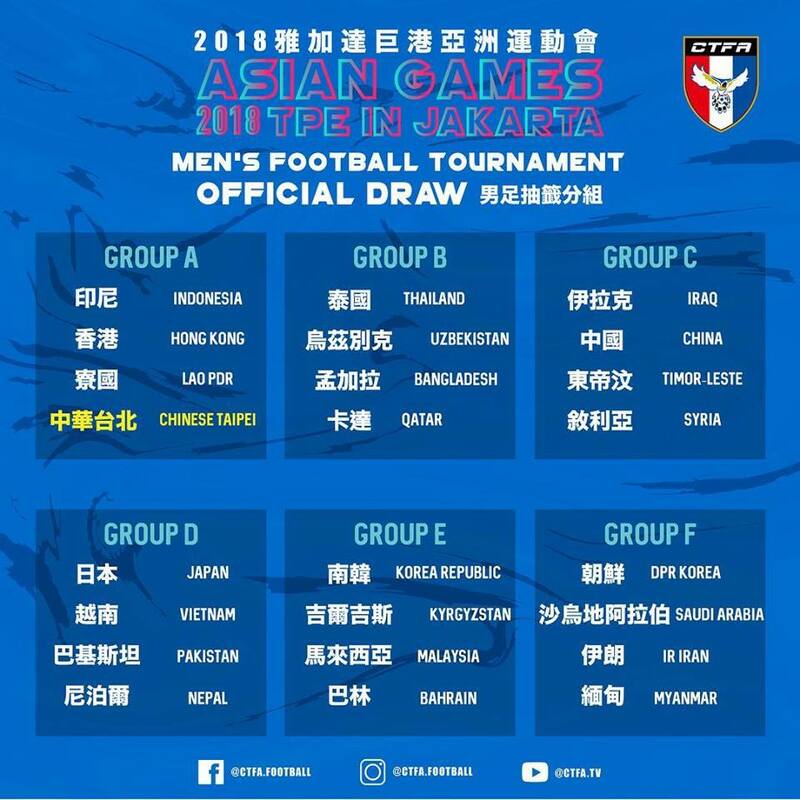 The Asian Games draw has been made and six East Asian sides will compete in both the men’s and women’s football competition. Football at the Asian games is an under 23 competition similar to the football at the Olympics but each team is allowed to field three over age players. The six teams involved are Hong Kong, Taiwan, China, Japan, South Korea, and North Korea (listed in group order from A-F). All six teams will be represented by both men’s and women’s teams but the not as many countries sent women’s teams so there are only three groups A – C.
For the men’s draw: Hong Kong and Taiwan have been placed into group with Laos and host nation Indonesia, China have been placed in group C with Iraq, East Timor and Syria, Japan are in group D with Vietnam, Pakistan and Nepal, South Korea are in group E with Kyrgyzstan, Malaysia and Bahrain and North Korea have been put in group F with Saudi Arabia, Iran, and Burma. For the women’s draw: South Korea and Taiwan have been placed in group A with Indonesia and the Maldives, North Korea, Hong Kong and China have all been placed in group B with Tajikstan and Japan have placed in group C with Thailand and Vietnam. Group C only has three teams in the women’s event. Japan, South Korea and China will be expected to put up a good showing as they’re considered to be the biggest of the ten national sides from East Asia, North Korea are often a mixed bag, as was seen in their Asian Cup qualifying, sometimes they can be excellent and sometimes get hammered. As for Taiwan and Hong Kong the Asian Games will be seen as another chance to continue the excellent development these countries have been making recently. Both Hong Kong and Taiwan narrowly missed out on Asian Cup qualification which obviously gives them a platform to build on. However, Hong Kong and Taiwan have been drawn to play each other in group A which gives both of them a fighting chance of getting out of the group, considering the other teams are Laos and Indonesia. 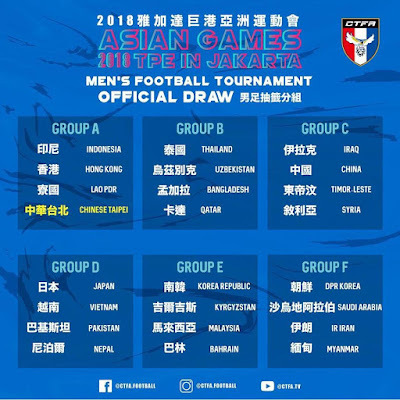 Indonesia will be expected to be a tough opponent but with them having home advantage and likely a partisan support then it will be even tougher, Laos though are one of the weakest sides from South East Asia and both Hong Kong and Taiwan are capable of beating each other, so both sides will be thinking they have a chance of making the next round due to the draw they’ve been handed. One interesting thing will be to see if South Korea call up Son Heung-min because the Asian Games falls during the Premier League season, but Tottenham and their fans will be desperate for Son to win the Asian games with South Korea meaning that he would win an exemption from his military service. With this likely being the last chance for Son to win an exemption Spurs would be crazy not to let him go, but the word on Twitter is that Spurs will release him to play. Clubs don’t have to release their players because the Asian Games falls outside of the FIFA international window but if the word on Twitter is correct then Spurs have definitely made the correct decision. The Asian Games is held in Jakarta, Indonesia and the football will run from the 14th August until the 1st September.